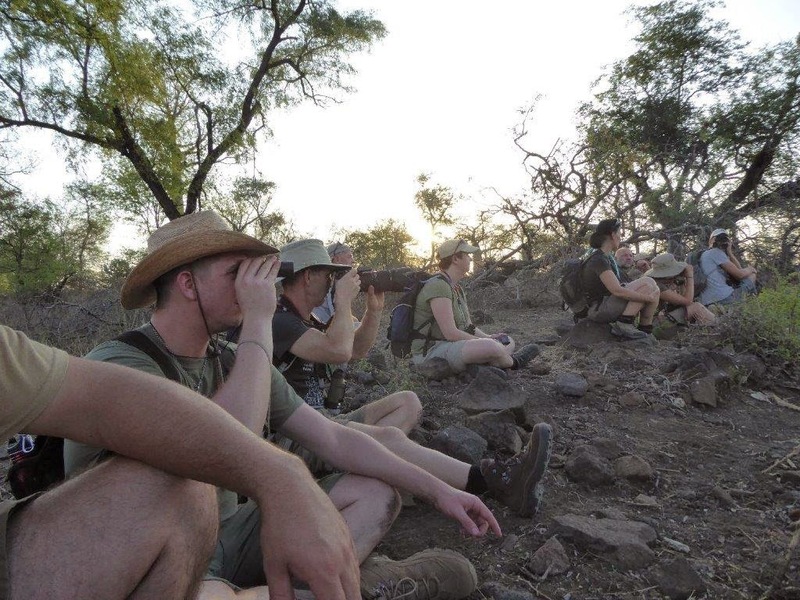 As part of the EcoTraining courses the students go out on regular activities in the reserves. As a result of these activities they have numerous exciting encounters. Rhodes Bezuidenhout shares his experience. "With our light lunch a thing of the past, the Group, armed with notebooks and the all-important sundowner cooler box, made their way to the car park to embus on the vehicle for the afternoon activity. The objective of the afternoon being to walk the Hlangaluwe Pan area, revising details of the characteristics of the trees and tracks that we had already covered thus far on the course and to introduce new examples as we came across them, while also obviously looking to enjoy a beautiful area of the Concession! Little did we realise that the planned revision would ultimately take a back seat on this walk!! 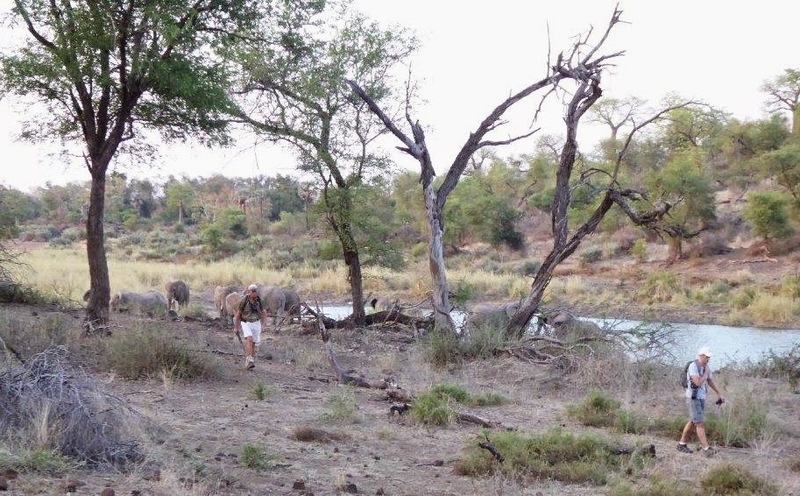 Driving down Middle Road the floodplains of the Limpopo River were indeed alive with plains game and birds. 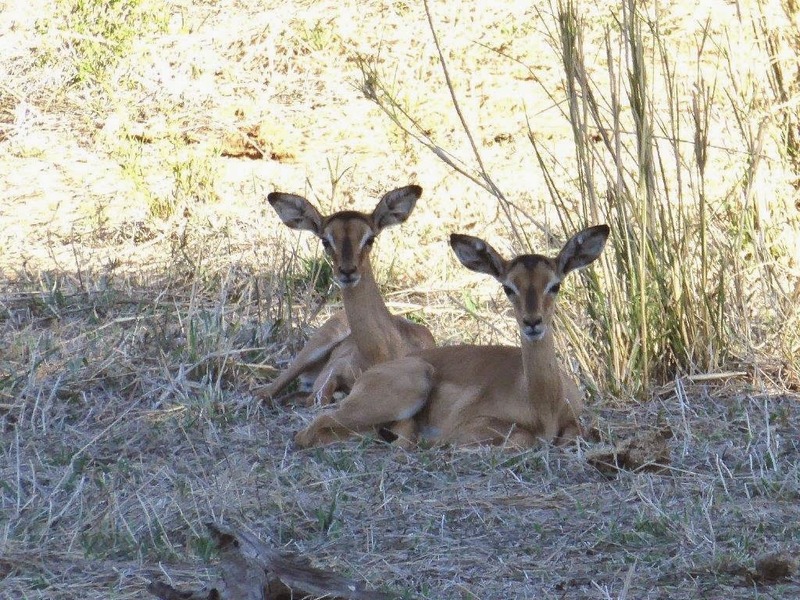 Buffalo, Kudu and Zebra were in abundance while Impala lambs were becoming more visible after joining the herds and forming their protective nurseries. Young Impala on Middle Road, Makuleke Consession. 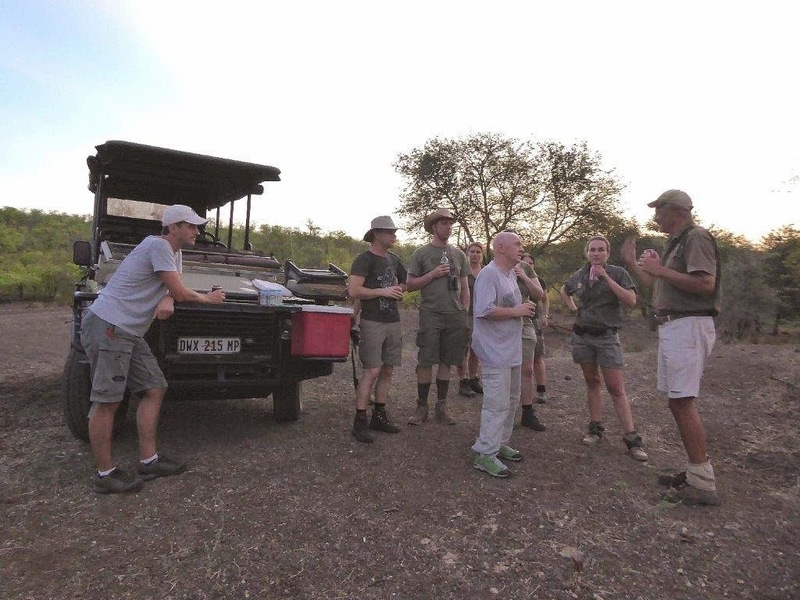 Reaching our jump-off point, we parked next to a fallen young Baobab, conducted the safety brief then walked northwards over the small crest to link up with the paths that would ultimately lead us to the Pan. 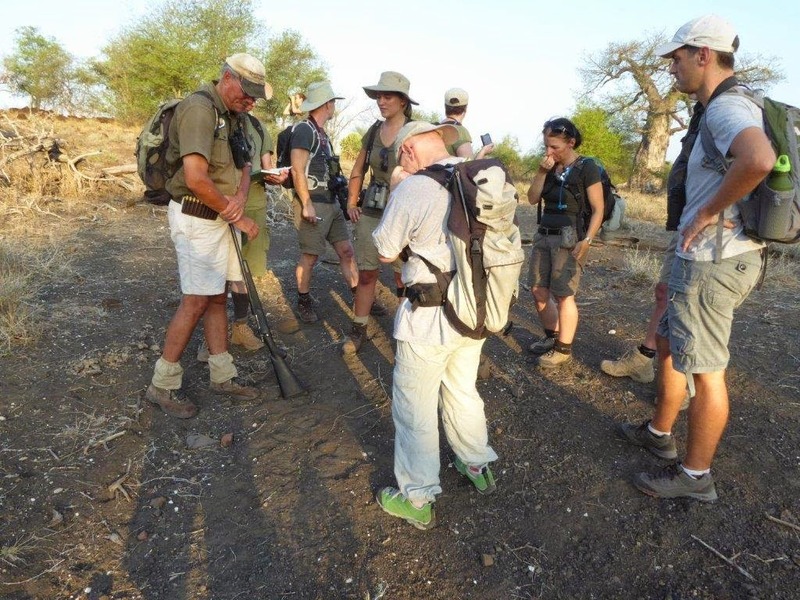 We stopped to review the characteristics of the Acacia Knob Thorn and the Apple Leaf trees on our way to the small ridge that overlooks Palm Vlei just to the west of Hlangaluwe. The view from this vantage point is always inspiring with the Fever Tree forest to the left and the Hlangaluwe kopje to the right on the far bank of the pan. 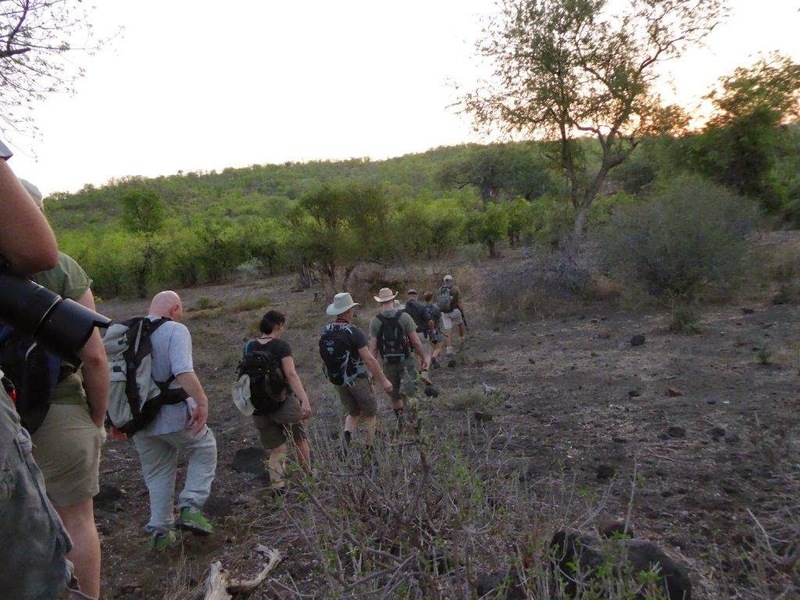 All appeared quiet as we made our way eastwards past the large Baobabs to come in behind the ridge overlooking the pan. We stopped to identify some tracks on the way but while doing so Tahina, my back-up guide for the walk, indicated an Elephant Bull emerging from the Fever Tree Forest into Palm Vlei, the area that we had just been viewing from the ridge. As the Group gathered together to watch, the Bull made his way slowly out of the forest and into the Lala Palm thickets. Bearing in mind the time of day, the Bull was undoubtedly heading to the pan to drink, presenting us with a great opportunity for a wonderful encounter. Tahina and I quickly moved the Group to the top of the ridge overlooking the pan which had a commanding view of the area. Leaving Tahina with the Group, I descended to the raised bank of the pan looking for the best possible position and while doing so, observed a second Bull emerge from the Fever Trees! Indeed, by the time I had found a suitable site and signalled for the Group to join me, I counted 5 Elephant now making their way towards us and the pan across Palm Vlei. With the Elephants appearing in no hurry to get to the water at this stage, I took the opportunity to quietly brief the Group on keeping movement and noise to a minimum as, if the Elephants came down to drink where I thought they would, it was likely that would be no more than 30 metres from us across the water! I requested everybody to sit down at the edge of the elevated bank taking up comfortable positions, flashes of cameras off and to be patient as things developed. I was glad to see Tahina taking up a position on the far end of the Group to give both of us a clear view of the area! Finally the first Bull slowly made his down through the plains grassland to the water opposite us, very close, the Group very quiet!! 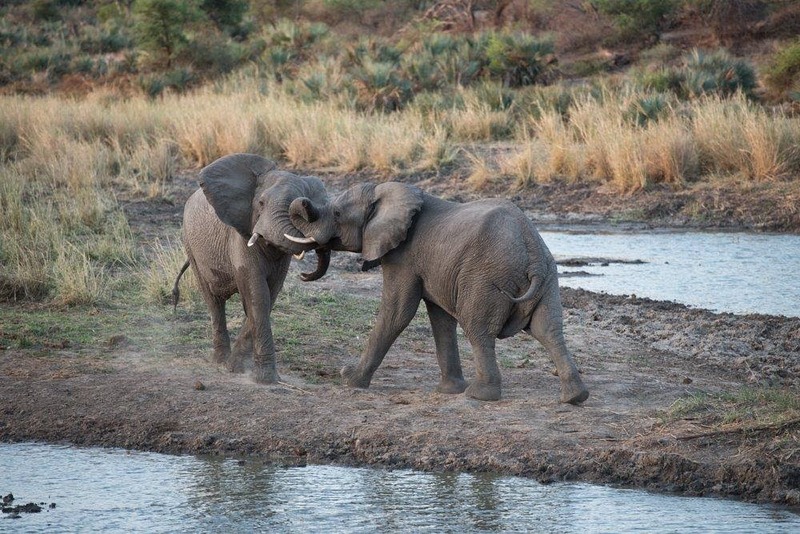 With further Elephant emerging from the Fever Trees to our left, very soon we had three Bulls at the water’s edge dipping their trunks into the water! Cameras then whirred and clicked seemingly so loud in the silence of the late afternoon that I thought the noise would disturb the Bulls! The faces of the Group were indeed a picture watching in some amazement as the Elephants sucked up the water into their trunks then hosed it into their mouths. A big Bull then joined the trio at the water, jostling his way in between them as to show his dominance before he too commenced drinking. In no time at all we had all eight Elephant drinking in front of us, so close you could hear the breaths being taken by the animals between slurps of water! 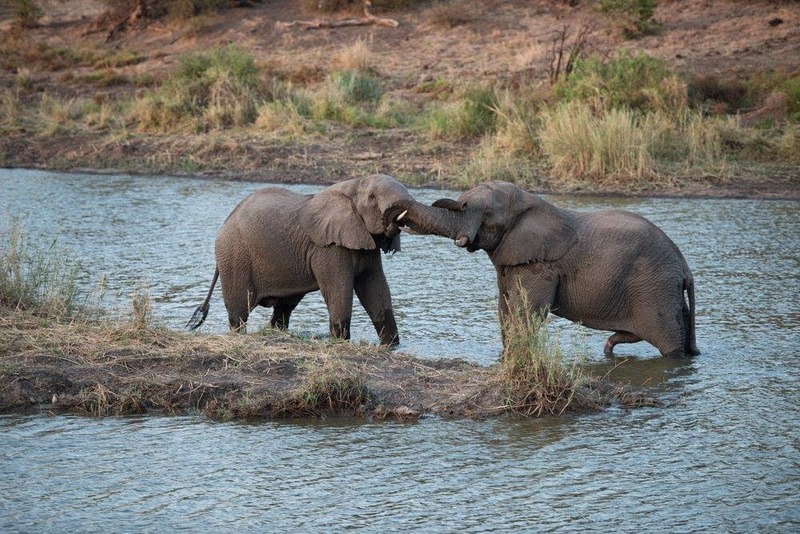 Two of the Bulls then decided to have a test of strength and played out a mock battle, forehead to forehead, trunks wrapped around heads and tusks rasping together as they engaged and pushed against each other! Soon a second duo were also duelling, one standing in the water! Very special!! We were indeed very privileged to be able to witness this very important daily ritual of watering at such close, but safe, quarters. The problem was that more and more Elephant were now seen to be emerging from the Fever Trees including cows and calves! A breeding herd! By this time, we had spent a good 20 minutes with the Elephants at the pan and with the sun now threatening the horizon and the new arrivals beckoning, it was definitely time not to overstay our welcome! I managed to send a silent message to the Group to pay attention, then signalling Tahina at the far end to slowly rise and back out down a path away from the bank. As she managed to do so without disturbing the Elephant at the water, I signalled for the next person to do the same and to join her, repeating the process one by one to minimize movement and noise. The extraction went off without a hitch and as the last out, I glanced back to ensure that the Elephant were still comfortably engaged at the water’s edge noticing that their numbers were increasing all the time in the fading light! Definitely the right decision to leave!! Reforming silently, I led the Group back up the ridge to our original entry point and then over the crest, where everybody quietly but animatedly exchanged individual experiences! With so many Elephant now in the area, but not in view behind the ridge, I wanted to ensure our path back to the vehicle was clear and as such needed to see the status of the herd. Heading west until reaching the edge of the ridge, I took the Group up to the crest once more for a final view with the advantage of height .Palm Vlei was indeed alive with Elephant, most were still heading down to the water but with some drifting towards us threatening our route to the vehicle. I gave the Group a limited time on this sighting before deciding to take a direct route back to the road then following that back to the vehicle to avoid any encounter in the thick Mopane trees between the pan and the road. In the fast diminishing light, we reached the vehicle with no problems and drove a short distance to the Palm Vlei look-out for sundowners. 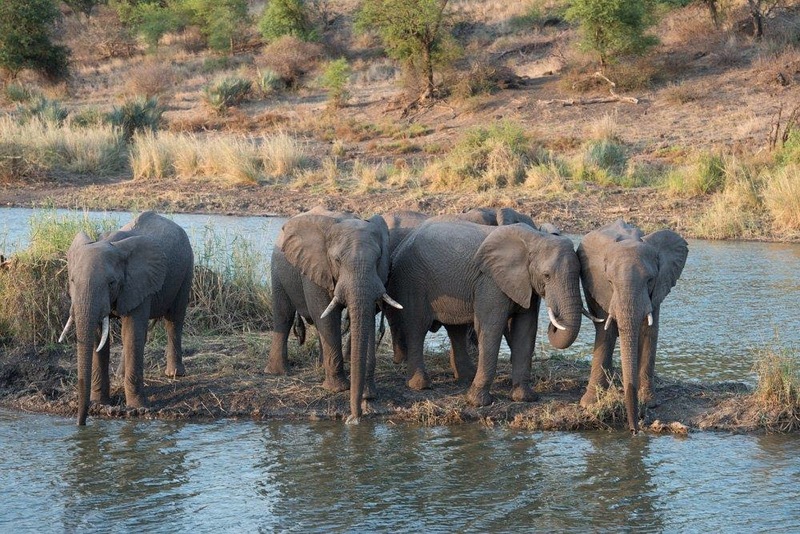 While breaking open the cooler box and distributing drinks into satisfied hands, most of the elephant had by this time reached the water at the pan, now out of our sight to the east, with only a small herd to our front. Buffalo and Zebra were also visible to our right in the Lala Palm thickets. An amazing afternoon spent in a beautiful area, a real privilege to have been part of a great sighting."